Why does quantum mechanics work so well for microscopic objects, yet macroscopic objects are described by classical physics? This question has bothered physicists since the development of quantum theory more than 100 years ago. 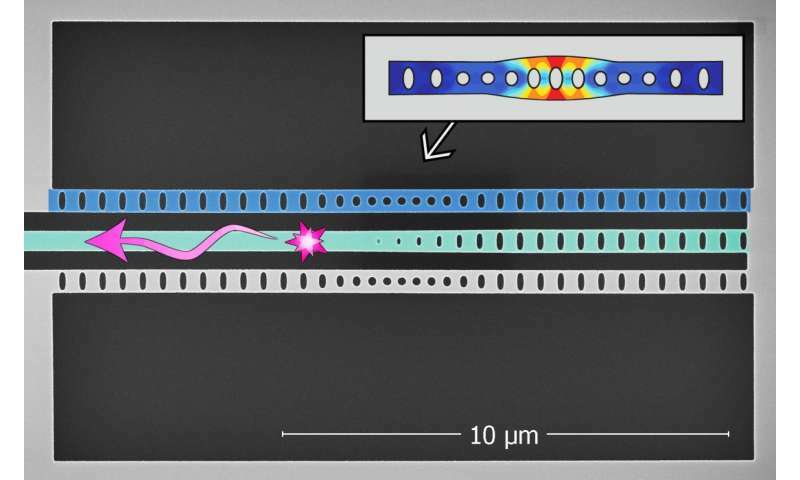 Researchers at Delft University of Technology and the University of Vienna have now devised a macroscopic system that exhibits entanglement between mechanical phonons and optical photons. They tested the entanglement using a Bell test, one of the most convincing and important tests to show a system behaves non-classically. Ever since its inception more than 100 years ago, physicists realized that quantum theory might be in conflict with some of the basic axioms of classical physics. In particular, the principles in question are if information can be exchanged faster than the speed of light (called 'locality'), and whether physical quantities exist regardless of whether they are observed or not (called 'realism').Albert Einstein once famously asked Abraham Pais, his biographer, if he really thought the moon only existed when he looked at it. A heated debate between Einstein and Niels Bohr on this conflict of axioms in the 1930s started decades long research on the correlations between quantum systems. This phenomenon, called quantum entanglement, quickly crystallized as one of the key predictions of quantum mechanics. Work by John Bell in the 1960s opened up a route to test these principles experimentally, which added new and exciting results to the debate. Most quantum experiments performed to date, however, deal with either one or a relatively small number of particles. A team of scientists led by Prof. Simon Gröblacher from Delft University of Technology have now entered a completely new scale of quantum measurements. They created a device that yielded correlations between the vibrational motion of silicon optomechanical oscillators, comprising approximately 10 billion atoms, and optical modes. The devices were cooled to their motional ground states inside a dilution refrigerator and were then probed with laser pulses. Specific laser frequencies are able to interact with the devices, either exciting the motion in a controlled fashion or reading out its state. Whenever this happens, correlations arise between the scattered light and the devices that make it possible to perfectly predict the behaviour of one of them by the other. In order to test whether the correlations in their system were, in fact, quantum mechanics at work, and not classical physics, they performed a Bell test. The two particles were essentially presented with a choice: The experiment was devised in such a way that they could each be registered in one of two detectors. Both outcomes were equally likely by design, which made it impossible to predict the result for photons or phonons individually. However, due to the correlations between the two, the phonons could be made such that they always give a corresponding measurement result to the photons. In about 80 percent of the cases, they were found to behave that way, which is well above the classical Bell threshold of about 70 percent. The real Bell test was to tweak certain experimental parameters that affect the two particles in different ways and see when this dependence breaks down. Quantum-mechanically, the two can maintain correlated measurement outcomes for much longer than what is classically allowed. "This is the most thorough test of a massive device behaving quantum mechanically yet performed," said Prof. Gröblacher. These results imply that quantum mechanics extends up to the macroscopic domain. Moreover, the device the researchers fabricated can be enlarged and improved upon. Gröblacher: "As our experimental protocol is independent of the size of the oscillator, these results lay the foundation for the possibility of probing the boundary between classical and quantum physics with arbitrarily large objects, even ones visible to the naked eye." "We create a maximally entangled optomechanical Bell state between the collective vibrational motion of two silicon optomechanical oscillators, each comprising approx. 10^10 atoms, and two optical modes." @Phyllis, check out the Fluctuation Theorem. It defines how entropy works more accurately than the Second Law of Thermodynamics, which is a classical law. You will find when all is said and done that this has intimate ties to entanglement. As a teaser, entropy breaks entanglement. Quantum entanglement at the macro level has so many exciting possibilities. My favorite is that entanglement could solve the Fermi Paradox. We could just be looking for the wrong type of signal in the noise. How many charges exists to create the wavelets per what distribution and driver? All gerry rigged, com'on!